By Night - No Stillness is a study in black, where black becomes a radiant space within which one finds inner light. 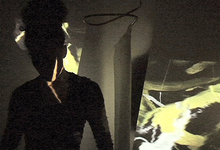 Dancer Miriam Parker and percussionist Hamid Drake perform within a video projection of a black and yellow painting on Parker's body. The sculpture is by Jo Wood-Brown.